If you’re remodeling your kitchen and looking to boost your efficiency, make sure to follow these kitchen layout tips. Kitchen remodeling best practices put functionality above form factor and style. After all, it’s ease of use that boosts your efficiency in cooking. When you developed your kitchen cabinet layout based on functionality, the style will fall into place. Needless to stay, the choice of kitchen cabinets and their installation is a huge factor in the layout decision-making process. Depending on the kitchen size, utensils and cooking process, you want to maximize the kitchen storage and customize the cabinets for optimum performance efficiency. Here are some kitchen layout tips to help you get there. A smart kitchen layout is critical to increasing the efficiency of your kitchen, especially when you have to work with a small kitchen. Poorly designed kitchen layouts make your work harder. A kitchen range or stovetop is where you spend most of your time cooking food; therefore, you want to make sure the adjacent cabinets are designed to give you quick access to the pots and pans. Kitchen remodeling professionals recommend installing cabinet drawers to the left and right of your range. For example, cabinet drawers, spice pull-outs, and adjustable roll-out trays should be close to the kitchen range for easy and quick access to the contents. Kitchen appliances are pretty useful for cooking but they also take up crucial places in your kitchen. While it’s easier to tuck away small appliances, larger cabinets -mixture, slow cookers, blenders -are harder to hide and store. Therefore, you need to plan for a dedicated spot in your kitchen to store your larger appliances. That’s why it’s important to plan the layout of your kitchen well in advance. Depending on the kitchen size and layout, as well as the usage frequency of specific appliances, you want to either hide them in the back of your base cabinets or use slide-out drawers in your base cabinets for easy access. For those looking to show off their elegant appliances, they can create a dedicated open cabinet shelf to display those prized appliances. While the large drawers in your base cabinetry offer a great deal of storage space, they are not meant to store your cookie sheets, muffin tins, large platters. 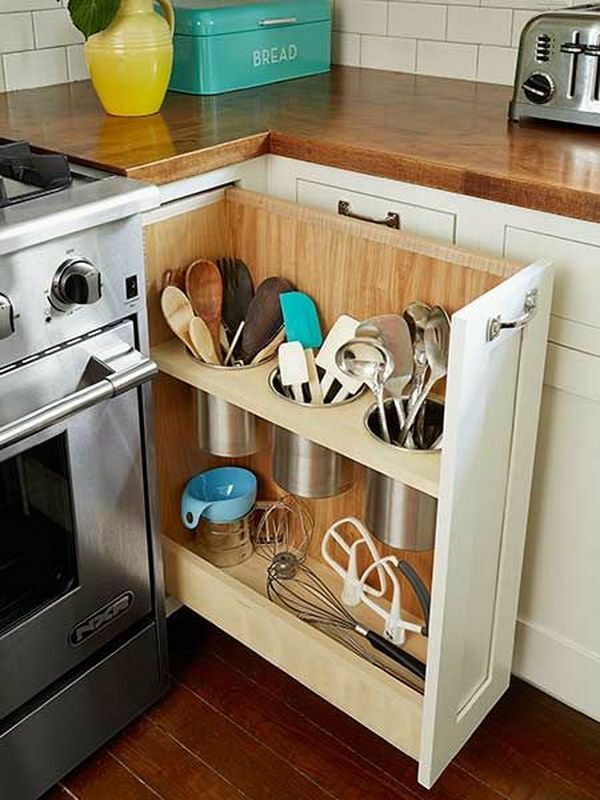 The solution, therefore, is to find some vertical storage near the range for easy access to your those utensils related to baking. Contrary to popular misconception, the drawer under your stove is NOT actually a place to store your utensils and baking supplies; rather, they are meant to keep your cooked food warm. While you can store your baking supplies and utensils above your large pantry or double oven tower, here are some innovative tricks to organize them better. The location of your trash cabinet affects the functionality of your kitchen. If you’re using roll-out trash bins in your base cabinet, make sure they are located close to your dishwasher and kitchen sink. Likewise, the knives should be stored in a drawer close to the sink and dishwasher. The further they are from the sink or dishwasher, they higher are the chances of potential accidents during cleaning and storage. Everyday cooking utensils and flatware should be stored at an arm’s length of the dishwasher while the spices should be close to your kitchen stove for easy access and efficient cooking process. If you have large drawers, try to outfit the top drawers with organizers to create specific slots for flatware as per their sizes. Likewise, use a slanted drawer organizer to store your spices for ease of usage. A great kitchen layout not only makes your cooking process a breeze but it also decreases the chances of potential kitchen mishaps. Therefore, it’s essential to plan your kitchen layout and customize your storage units for optimal performance.